Patti Sokol, Adobe Sr. solutions consultant, was sitting in San Francisco’s famously terrible traffic, wondering what she could use as a theme for the project for CC @MAX, a hands-on, pre-conference lab she teaches at Adobe’s annual creative event. Then, as it does for so many others, a butterfly appeared just when she needed it. “Waiting at a stoplight, I saw a beautiful butterfly wall installation on the side of a boarded up post office in San Francisco’s Tenderloin district. The butterfly graphic with the words ‘Be the Change You Want to See in the World’ struck me as a perfect combination of creativity plus philosophy—and a great potential project that my students could use to express their creativity and incorporate the new Creative Cloud product features that they learn during the CC @MAX lab,” Patti said. She went back to the office and through a little research, found The Butterfly Effect and read up on contagious generosity and Butterfly Drops. She was delighted and knew that providing butterflies to her students would add greater meaning to their projects. Not only could they gain new software skills, but they could also facilitate giving in the process. The students, all adult creative professionals, come to Adobe MAX to be inspired, to enhance their skills, and to learn new features of Adobe Creative Cloud. 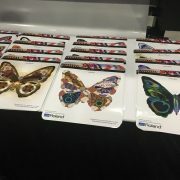 They were provided with a Photoshop template of the butterfly and a creative brief. 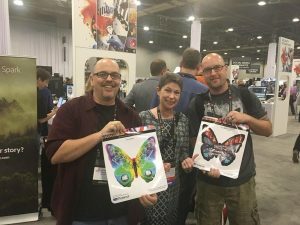 Patti found help from a longtime Adobe partner, Roland DGA, which makes a printer that would print and cut the vinyl sticker students would affix to the wooden butterflies. Patti was able to use the butterflies at two events in 2017, reaching 150 different students. 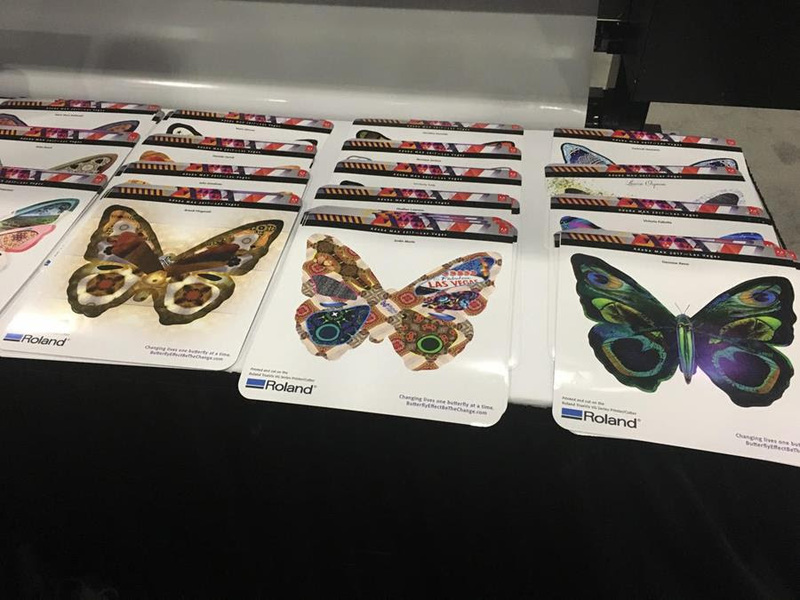 For each butterfly, Adobe contributed $50 and the Butterfly Effect contributes $50; the total $100 will go to the charity of the finder’s choice. “Part of the fun of contagious generosity is seeing where they are dropped, who will find them, and which charity will be selected,” Patti said. The feedback from her students was formidable—they appreciated doing something that was practical and would help to give back. “I’m very lucky to work for a company like Adobe, which encourages employees to create positive change in the world around them by supporting causes through donations and volunteer work. Butterfly Effect resonated for me because I believe that our small, individual actions collectively make an impact on the world around us. As part of the creative brief, I asked the students to express the Butterfly Effect theme of, ‘Be the change you wish to see in the world.’ For my butterfly I chose the theme of kindness. Simple acts of kindness can have a large effect on the world,” Patti said.